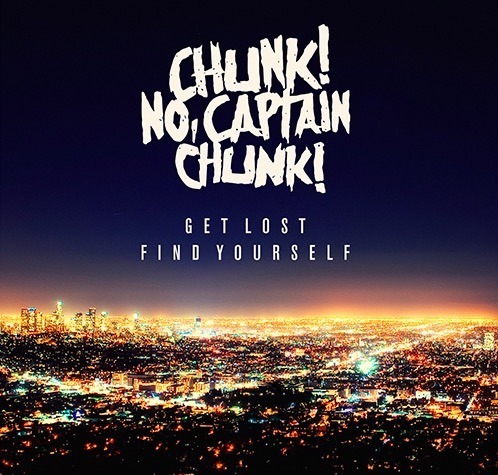 Review:: Get Lost, Find Yourself | Chunk! No, Captain Chunk! Leave a Comment on Review:: Get Lost, Find Yourself | Chunk! No, Captain Chunk! I’ll be the first to admit that I didn’t give much attention to Chunk! No, Captain Chunk! when they first arrived. It wasn’t done maliciously or out of spite or, now that I think about it, it wasn’t even done intentionally. I guess they just showed up while I had things going on, who knows. There’s a point to this; in the here and now, this lack of previous focus acts in both my favor and theirs. On Get Lost, Find Yourself, I’m getting a fresh impression of a band who are seeming to hit their stride. After a pair of good tracks, “The Other Line” provides the first great one. Systematically scattered, with transitions between clean and harsh vocals, pop-punk choruses and easycore breakdowns, there’s a constant push-and-pull that lands the song balanced somewhere in the middle. Follow-up “Set it Straight” continues down the path of cleaner style, but ends up sounding like more of extension of its predecessor rather than its own separate piece. Just because there’s a taste of pop-punk doesn’t mean there isn’t a presence of plenty of heavier material. The two opening tracks I mentioned before both kick in with huge guitar riffs, while “Pull You Under” gets the blood racing immediately and keeps a tight grip. While the group takes its chances (see: the obscure introduction into “Worst Case Scenario”), these aren’t all for the better. The plucky guitarwork to the previously-mentioned “Worst Case Scenario” takes a moment to reset from, dropping a decent track to sub-par. However, there are positives to balance out the negatives: “What Goes Around” avoids the temptation to add the guttural backing vocals you’d expect from a song of this style and tempo within this genre. Rather, Bert Poncet’s voice is arguably at its best here and is given the opportunity to be showcased. Closing out with “Every Moment,” the five-piece combines some of the album’s cleaner, smoother moments with some of its harshest. The sharp contrast between the two is successful within the song, and allows for great lasting value. Hearing progress and growth from a band is a rewarding experience. When a band’s strengths are on display, and better yet, are being sharpened and worked on further, it shows that they’re trying to be as good of a band as you are a fan. Chunk! No, Captain Chunk! are three albums into their career, and things are looking up. I don’t see myself postponing my first listen of LP4 when it comes around.